I am a writer and filmmaker whose first book, Get Close: Lean Team Documentary Filmmaking is now available from Oxford University Press. Along with my wife and filmmaking partner, writer Ann Hedreen (Her Beautiful Brain), we own White Noise Productions, where we’ve made more than 160 short documentaries for non-profit organizations. My feature length films include 30 Frames A Second: The WTO in Seattle (2000), which won several Best Documentary awards, was named one of the Top Ten films of the year by the American Library Association, and one of the Best Undistributed Films of 2001 by The Village Voice. My latest documentary, a memoir film, is called My Mother Was Here and is an official selection of the 2019 Sebastopol Documentary Film Festival. I’m currently in production on the essay films Slow Revolution and The Malheur Diaries. In the last 19 years Ann and I have also produced Quick Brown Fox: An Alzheimer’s Story, The Church on Dauphine Street (set in post-Katrina New Orleans), and Zona Intangible, set in a squatter city near Lima, Peru. Many of our documentaries are available from the leading distributors Bullfrog Films, Women Make Movies, Alexander Street Press and Gunpowder & Sky. They can be found on the streaming platforms iTunes, Amazon, Hulu, and Google Play, and they can also be rented or downloaded from Vimeo On Demand. 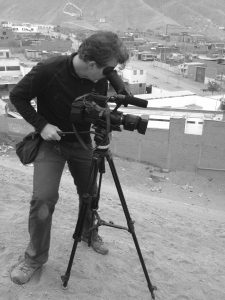 Before I became a filmmaker, I worked as a cameraman/editor/producer in local TV news in Reno, Colorado Springs, and Seattle. In the ‘90s I freelanced as a CBS News cameraman and won a national Emmy for a series of stories shot in North Korea. During my time with CBS I was paid well, traveled often, stayed in sweet hotels on an expense account, and worked a lot of overtime. I’ve never made that kind of money since! I graduated with a not entirely useless degree in Broadcast Journalism from the University of Washington. I’ve also written film criticism for Moviemaker, Crosscut, and KBCS.FM, a really lovely community radio station where I host the Americana program Road Songs (whose patron saint is Townes Van Zandt). Ann and I live in Seattle and are thankful our grown kids, writer-wanderer Claire Thompson and filmmaker-photographer Nick Thompson, like to hang out with us.